Dec 3, 2018 Posted by AAfterwit on Dec 3, 2018 | Comments Off on Cops Behaving Badly. This Is Depressing. Cops Behaving Badly. This Is Depressing. Back on July 5, 2018, journalist and editor of the Colorado Independent observed a naked black man sitting handcuffed on the sidewalk surrounded by the Denver police. She stopped her car and started to try and film the incident. She was then approached by Denver Police Officer James Brooks who told her to stop filming. Below is body cam footage of the incident. Greene first appears in the shot at around the 0:11 second mark. Notice how far she is away from the man and the officers. She is in no way interfering with their dealings with the man. [Brooks] continues to block her as she tries to keep shooting, at one point raising the camera high above Brooks’s head. Brooks is quickly joined by Officer Adam Paulsen, and the two advise her that she can not take photographs because doing so violates the HIPAA rights of the nearly naked man they have cuffed. HIPAA or the Health Insurance Portability and Accountability Act outlines an individual’s rights to medical privacy. “That doesn’t supersede HIPAA,” Paulsen says. Officer Brooks is wrong on the law. HIPAA does not apply to non-medical personnel. Paulsen’s claim that the First Amendment”doesn’t supersede HIPAA,” is not only wrong, it is backwards. Paulsen claims the First Amendment doesn’t supersede HIPAA, when in fact he should be arguing that HIPAA supersedes the First Amendment, which it does not. Before arresting Greene, Brooks tells her she will be arrested for “interfering.” This is another point at which Brooks and Paulsen are just making stuff up as they go along. Sec. 10-3-30. Interference with police. (a) It shall be a violation of this Code for any person to interfere or attempt to interfere by use of any physical action with any police officer, any member of the Police Department or any person duly empowered with police authority while such officer, member or person duly empowered with police authority is discharging or apparently discharging his or her duties. Interference shall include, but is not limited to, physical actions intended to aid a person who is resisting an arrest or is being arrested. Greene never moves in such a way that is preventing any officer from doing their job as far as the man in handcuffs is concerned. She is well away from where the man is and well away from the officers rendering the man aid. That didn’t matter to Brooks of Paulsen. “Stand up and act like a lady,” Brooks says. In any case, I’m curious to hear, after reviewing the body-cam video, Denver police officials explain how exactly a woman should behave on a perp walk after having been blocked from doing her job, obstructed from exercising her First Amendment rights, handcuffed and otherwise manhandled by an ignorant and over-amped police officer and his sidekick. After about 10 minutes in cuffs, and after Brooks talked to someone on a cellphone, Greene was released. 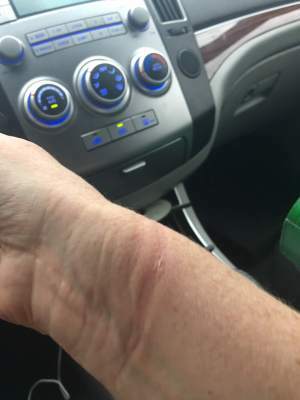 She took a picture of her wrists showing how her “walking” caused them injury and pain. You would think that within the total of the incident, the officers would face charges, right? Denver District Attorney Beth McCann gave me (Greene) the courtesy of a phone call today to say her office won’t be prosecuting Brooks. She said a charge of false imprisonment wasn’t an option because there’s an exemption for cops. And she said her office likely would have a tough time convincing a jury that Brooks assaulted me. were a journalist, for one thing,” she said. “But people are entitled to take pictures as long as people are not” getting in the way of police. She added that Brooks’ “act like a lady” comment “was a little unnecessary.” And she said we’ll likely be hearing something from Hancock’s administration now that she has made her decision not to prosecute. Stop right there. Whether Greene identified herself as a journalist matters not one iota in this case. Anyone could have been walking down the street, saw the incident and start to film it. There’s no indication that Greene was treated differently because she did or did not identify herself as a journalist. The issue of identifying as a journalist doesn’t matter in the long or short run. What does matter is that the two officers are going to get off without criminal prosecution. Absent criminal prosecution, surely the Denver Police would take action, right? So I called Denver Police Department’s District 6 and spoke with Sgt. Shawn Saunders, who supervises Officer Brooks. He said he’d look into the incident and make sure the halo camera footage and other evidence are preserved for review. He gave me the option of filing a formal complaint against Officer Brooks. I told him I’d consider it, but that I don’t have a lot of confidence in Denver’s disciplinary system, which I’ve seen slap officers on the wrists for misconduct far more serious than this, only to have the Career Service Board side with the police union and overturn even the most meager disciplinary measures. To that, Saunders offered a response that was at once striking yet maddening in its candor. While all this is going on, Brooks and Paulsen remained on the force and on the street after violating a person’s First Amemdment rights, after misstating Federal law, after using that law to illegally arrest a person, after violating Colorado law on recordings and after injuring a citizens, the cops are still out there. We have said this before and will continue to say it. There are millions and millions of interactions between the police and citizens. The vast majority of those interactions go well and smoothly. Unfortunately, we are dealing with people and in the case of police forces, there are always going to be a few police that slip through the cracks and shouldn’t be wearing a badge. Paulsen and Brooks are the types of officers that cities and police forces should not want to employ. Just as importantly, Brooks and Paulsen are officers that other officers should not want on the force as their actions make the job of the good cops more difficult. It is wrong for people to broadly paint cops as either being great or horrible. Life is not like that and there are too many differences in people. However, when officers are this clueless and this willing to commit illegal acts because a citizen dared to defy them, they need to go find employment elsewhere. Sadly, that won’t happen. Police review boards and unions far too often serve to protect all cops and don’t care about the bad ones. For that, the public suffers.